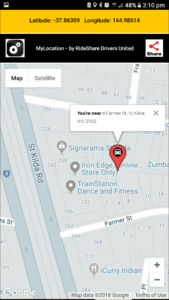 MyLocation by RSDU – Designed to help you locate street numbers fast. Proudly produced and powered by RideShare Drivers United. Introducing MyLocation-by-RSDU. Designed by a driver for drivers. A must have tool for any RideShare driver (Uber, Ola, Taxify, Grab, Lyft, Didi, Yandex etc.) or or anyone on the road anywhere in the world. This app will help you quickly locate an address in hard to find or dark streets. Ever found yourself on a street looking for an address where a street name or house numbers can not be easily seen? MyLocation-by-RSDU is designed to help you quickly pinpoint your location while clearly displaying street names and house numbers around you. 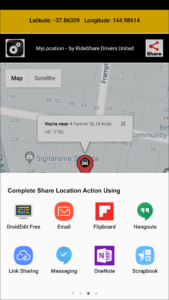 MyLocation-by-RSDU also make it very easy to share your location with your contacts, via text or other messaging applications installed on your smartphone. 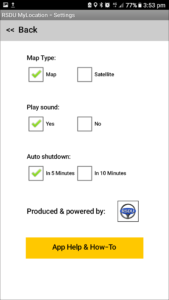 The app is capable of displaying your current Latitude and Longitude coordinates as well as offer an auto app shutdown to conserve battery power. Not only you will find this tool very helpful when looking up a street address or building/house numbers. All proceeds form the sales of this app (currently being sold for $1.99 cents only) help support RSDU’s driver’s advocacy work as well as future app development projects. Head to the Google playstore and download your copy now. Click here to learn more and get the Android version now.